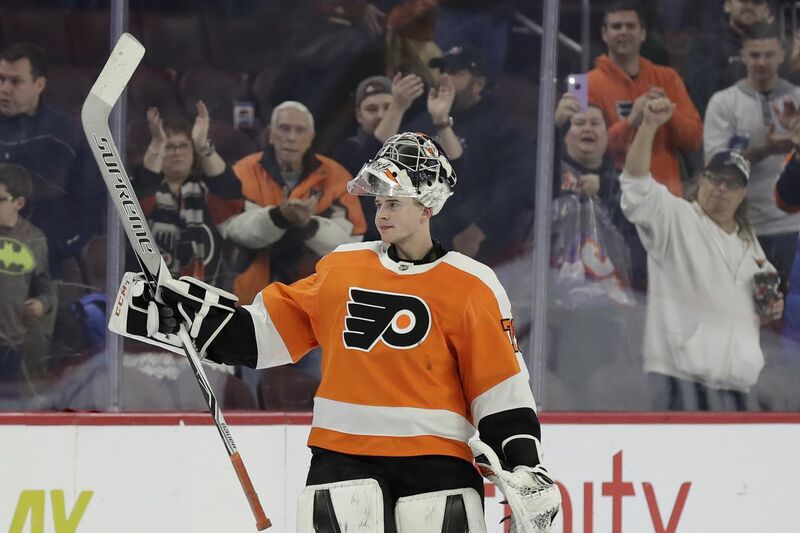 Ready or not, the Flyers promoted Carter Hart to invigorate a slumping team. So far, Hart has looked very ready. The All-Star break, which stretched for a little over a week before ending Monday night against Winnipeg, came at a seemingly inopportune time for the Flyers. It’s not like the season has been a joy ride through Pleasantville, so the apparently unwanted interruption was in keeping with the team’s recent luck. The Flyers have been through nearly every major upheaval an NHL franchise can endure, not to mention some decidedly dreadful results, since the home opener kicked things off with an 8-2 loss to San Jose that had uh-oh written all over it. And uh-oh it has been. The general manager, assistant general manager, head coach and an assistant coach were all fired as the front office grew impatient with a deliberate building strategy that had begun to look instead like a strategy for an empty building. Aside from having the roof blow off the arena, the team pretty much hit for the cycle on organizational chaos. Even with all that, nothing was going to save this season, so the new regime went for the next best thing: bring up the kid savior goalie so people will pay attention again. That’s a risky move in some ways, and not one previous general manager Ron Hextall -- who knows the position awfully well -- was prepared to do just yet. Rushing goalies to the big team, particularly when the big team isn’t ready to compete yet, can be disastrous. It would be interesting to know how much of Hextall’s dismissal was due to his obdurate refusal to compromise in general, and how much was specifically because he blocked the promotion of Carter Hart at a time the team desperately needed something to sell the fans. We’ll never know that one, but Hart came up a couple of weeks after Hexy was tossed and just a day or so before coach Dave Hakstol was given the chance to once again enjoy a North Dakota winter. Hart is 20 years old and has never known anything but success, and the Flyers figured if he was going to succeed it might as well be with them. To this point, after 13 starts, Hart has been doing fine with the next puck. His goals-against average and save percentage are both better than they were in 17 games with the Phantoms. His record after the 3-1 win over the Jets on Monday night isn’t stunning at 7-5-1, but consider the situation. The Flyers, in the words of new GM Chuck Fletcher, “have good players, [but] we haven’t been a good team.” With Hart, who gets a break against the New York Rangers on Tuesday night when Anthony Stolarz starts in goal, the team might not be actually good, but it sure looks better. Hart was in goal for all five games before the break as the team won four of them to end a post-Christmas skid that had extended to eight losses. He twice stopped the bleeding at a 2-0 deficit during that hot streak, games that the Flyers ended up winning. And then, with the team finally looking settled and possessing a little bit of rhythm, the break arrived. Hart has been a steady influence in that regard. He doesn’t cover all mistakes in the Flyers’ end, but he doesn’t let in soft goals, either. If it’s a stop he should make, he almost always makes it. Those gifts were evident in juniors and with the Phantoms. The unknown was how he would handle the big jump. Gordon, like Hextall, knows something about young goalies and what it takes to deal with the pressure. He played the position for Boston College and then scuffled to make it professionally. His path took him up and down the AHL and even included a stop in the East Coast Hockey League with the Johnstown Chiefs. Just before his 27th birthday, he made his NHL debut with the Quebec Nordiques, the first ECHL player to ever climb that ladder. Hart had a far different set of expectations, but the challenge of the next puck isn’t any different. Maybe this team’s luck is finally headed for a change. The Flyers overcame the effects of the apparently ill-timed break -- at least for a night -- and they are playing with confidence in front of a fuzz-faced kid who measured the goal and found it was the same width as back in Hickory. Bringing a hot prospect up too soon can go wrong, unless you happen to be lucky with him. And, boy, it’s way too soon to say this, but it feels as if the Flyers finally might be.